BETHESDA, Md., Jan. 29, 2019 /PRNewswire/ -- Lockheed Martin Corporation (NYSE: LMT) today reported fourth quarter 2018 net sales of $14.4 billion, compared to $13.8 billion in the fourth quarter of 2017. Net earnings from continuing operations in the fourth quarter of 2018 was $1.3 billion, or $4.39 per share, compared to a net loss from continuing operations of $817 million, or $2.85 per share, in the fourth quarter of 2017. The net loss from continuing operations in the fourth quarter of 2017 included a net one-time charge of $2.0 billion ($6.88 per share), substantially all of which was non-cash, primarily related to the estimated impacts of the Tax Cuts and Jobs Act (the "Tax Act"). Excluding the estimated impacts of the Tax Act, adjusted earnings from continuing operations were $1.2 billion, or $4.03 per share, in the fourth quarter of 2017. Cash from operations in the fourth quarter of 2018 was $2.2 billion, compared to $1.5 billion in the fourth quarter of 2017. Net sales in 2018 was $53.8 billion, compared to $50.0 billion in 2017. Net earnings from continuing operations in 2018 was $5.0 billion, or $17.59 per share, compared to $1.9 billion, or $6.50 per share, in 2017. Earnings from continuing operations in 2017 included a net one-time charge of $2.0 billion ($6.77 per share), substantially all of which was non-cash, primarily related to the estimated impacts of the Tax Act. Excluding the estimated impacts of the Tax Act, adjusted earnings from continuing operations was $3.9 billion, or $13.27 per share, in 2017. Cash from operations in 2018 was $3.1 billion, after annual pension contributions of $5.0 billion, compared to cash from operations of $6.5 billion in 2017, with no pension contributions. "The corporation completed another year of outstanding operational accomplishments and strong financial performance," said Lockheed Martin Chairman, President and CEO Marillyn Hewson. "As we look ahead to 2019, we remain focused on performing with excellence for customers, and our record backlog and differentiating portfolio have us well-positioned for continued growth and long-term value creation for shareholders." The following table presents the corporation's summary financial results. Business segment operating profit is a non-GAAP measure. See the Non-GAAP Financial Measures section of this news release for more information. Unallocated items for the year ended Dec. 31, 2018 includes the previously announced severance and restructuring charges totaling $96 million ($76 million, or $0.26 per share, after tax) associated with planned workforce reductions and the consolidation of certain operations at the corporation's Rotary and Mission Systems business. In the fourth quarter of 2018, the corporation recognized a non-cash asset impairment charge of $110 million ($83 million, or $0.29 per share, after tax, for the fourth quarter and year ended Dec. 31, 2018) for its international equity method investee, Advanced Military Maintenance, Repair and Overhaul Center (AMMROC). Additionally, in the first quarter of 2017, the corporation recognized a non-cash asset impairment charge of $64 million ($40 million, or $0.14 per share, after tax, for the year ended Dec. 31, 2017), which represents its portion of a non-cash asset impairment charge recorded by AMMROC. In the fourth quarter of 2017, the corporation recognized a previously deferred non-cash gain of $198 million ($122 million, or $0.43 per share, after tax, in the fourth quarter and $0.42 per share, after tax, for the year ended Dec. 31, 2017), related to properties sold in 2015 as a result of completing its remaining obligations. In the fourth quarter of 2017, the corporation recorded a net one-time charge of $2.0 billion ($6.88 per share in the fourth quarter and $6.77 per share in 2017), substantially all of which was non-cash, primarily related to U.S tax reform. For additional information regarding the one-time charge, see the Income Taxes section and the Non-GAAP Measures of this news release. In the fourth quarter of 2017, the corporation recognized an additional gain of $73 million related to the Aug. 16, 2016 divestiture of its Information Systems & Global Solutions (IS&GS) business, which reflects certain post-closing adjustments, including the final determination of net working capital and certain tax adjustments. The corporation incurred a net loss in the fourth quarter of 2017 causing inclusion of any potentially dilutive securities to have an anti-dilutive effect, resulting in the weighted average shares outstanding for basic and dilutive earnings per share being equivalent during the quarter. As a result of the corporation's net loss in the fourth quarter of 2017, diluted earnings per share for the quarters of 2017 will not equal the earnings per share amount for the year ended Dec. 31, 2017. Cash from operations for the year ended Dec. 31, 2018 includes $5.0 billion of pension contributions. The following table and other sections of this news release contain forward-looking statements, which are based on the corporation's current expectations. Actual results may differ materially from those projected. It is the corporation's practice not to incorporate adjustments into its financial outlook for proposed acquisitions, divestitures, ventures, changes in law and new accounting standards until such items have been consummated, enacted or adopted. 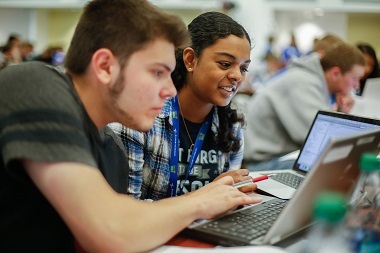 For additional factors that may impact the corporation's actual results, refer to the "Forward-Looking Statements" section in this news release. Consistent with the corporation's historical presentation, the net FAS/CAS pension adjustment is presented as a single amount and includes expected 2019 U.S. Government cost accounting standards (CAS) pension cost of approximately $2,565 million and expected financial accounting standards (FAS) pension expense of approximately $1,090 million. CAS pension cost and the service cost component of FAS pension expense is included in operating profit as part of cost of sales. The non-service cost component of FAS pension expense is included in non-operating expense on the corporation's consolidated statement of earnings. For additional detail on the corporation's FAS/CAS pension adjustment see the supplemental table included at the end of this news release. The foregoing outlook for 2019 does not reflect potential benefits, if any, from additional tax deductions for foreign derived intangible income under proposed US Treasury regulations that are expected to be released in the near future. Such proposed tax regulations, if favorable, may have a beneficial impact on our 2019 earnings, effective tax rate, and earnings per share. The corporation expects the 2019 net FAS/CAS pension benefit to be approximately $1.5 billion based on a 4.25 percent discount rate (a 62.5 basis point increase from the end of 2017), a negative 5.0 percent return on plan assets in 2018, a 7.0 percent expected long-term rate of return on plan assets in future years (a 50 basis point decrease from the end of 2017), and the revised longevity assumptions released during the fourth quarter of 2018 by the Society of Actuaries. As a result of the $5.0 billion in contributions to its qualified defined benefit pension plans in 2018, the corporation does not expect to make contributions to its qualified defined benefit pension plans in 2019.
receiving net proceeds of $110 million and $600 million from the issuance of commercial paper during the quarter and year ended Dec. 31, 2018, compared to no net proceeds during the quarter and year ended Dec. 31, 2017. The corporation operates in four business segments organized based on the nature of products and services offered: Aeronautics, Missiles and Fire Control (MFC), Rotary and Mission Systems (RMS) and Space. The following table presents summary operating results of the corporation's business segments and reconciles these amounts to the corporation's consolidated financial results. Net sales and operating profit of the corporation's business segments exclude intersegment sales, cost of sales, and profit as these activities are eliminated in consolidation. Operating profit of the corporation's business segments includes our share of earnings or losses from equity method investees as the operating activities of the investees are closely aligned with the operations of its business segments. Operating profit of the corporation's business segments also excludes the FAS/CAS operating adjustment described below, a portion of corporate costs not considered allowable or allocable to contracts with its largest customer, the U.S. Government, under the applicable U.S. government cost accounting standards (CAS) or federal acquisition regulations (FAR), and other items not considered part of management's evaluation of segment operating performance such as a portion of management and administration costs, legal fees and settlements, environmental costs, compensation expense, retiree benefits, significant severance actions, significant asset impairments, gains or losses from significant divestitures, and other miscellaneous corporate activities. The corporation recovers CAS pension cost through the pricing of its products and services on U.S. Government contracts and, therefore, recognizes CAS pension cost in each of its business segment's net sales and cost of sales. The corporation's consolidated financial statements must present FAS pension and other postretirement benefit plan expense calculated in accordance with U.S. generally accepted accounting principles (FAS) requirements under U.S. GAAP. The operating portion of the net FAS/CAS pension adjustment represents the difference between the service cost component of FAS pension expense and CAS pension cost. The non-service FAS pension cost component is included in other non-operating expense, net on the corporation's consolidated statements of earnings. The net FAS/CAS pension adjustment increases or decreases CAS pension cost to equal total FAS pension expense (both service and non-service). Changes in net sales and operating profit generally are expressed in terms of volume. Changes in volume refer to increases or decreases in sales or operating profit resulting from varying production activity or service levels on individual contracts. Volume changes in segment operating profit are typically based on the current profit booking rate for a particular contract. In addition, comparability of the corporation's segment sales, operating profit and operating margin may be impacted favorably or unfavorably by changes in profit booking rates on the corporation's contracts for which it recognizes revenue over time using the percentage-of-completion cost-to-cost method to measure progress towards completion. Increases in the profit booking rates, typically referred to as risk retirements, usually relate to revisions in the estimated total costs to fulfill the performance obligations that reflect improved conditions on a particular contract. Conversely, conditions on a particular contract may deteriorate, resulting in an increase in the estimated total costs to fulfill the performance obligations and a reduction in the profit booking rate. Increases or decreases in profit booking rates are recognized in the current period and reflect the inception-to-date effect of such changes. The corporation's consolidated net profit adjustments not related to volume, including net profit booking rate adjustments and other items, represented approximately 29 percent and 32 percent of total segment operating profit for the quarter and year ended Dec. 31, 2018, compared to approximately 33 percent and 32 percent for the quarter and year ended Dec. 31, 2017. Aeronautics' net sales in the fourth quarter of 2018 increased $229 million, or 4 percent, compared to the same period in 2017. The increase was primarily attributable to higher net sales of approximately $240 million for the F-35 program due to increased volume on production and sustainment, partially offset by lower volume on development activities; and about $100 million for the F-16 program due to increased volume on modernization contracts. These increases were partially offset by a decrease of approximately $135 million for the C-130 program primarily due to lower volume on sustainment activities. Aeronautics' operating profit in the fourth quarter of 2018 decreased $31 million, or 5 percent, compared to the same period in 2017. Operating profit decreased approximately $35 million for the C-130 program due to lower risk retirements and lower sustainment volume, which was partially offset by an increase of about $20 million for the F-16 program due to increased volume on modernization contracts and higher risk retirements. Operating profit was comparable for the F-35 program with increased volume on higher margin production contracts and new development activities, offset by lower risk retirements. Adjustments not related to volume, primarily net profit booking rate adjustments, were about $115 million lower in the fourth quarter of 2018 compared to the same period in 2017. Aeronautics' net sales in 2018 increased $1.8 billion, or 9 percent, compared to 2017. The increase was primarily attributable to higher net sales of approximately $1.5 billion for the F-35 program due to increased volume on production and sustainment, partially offset by lower volume on development activities; about $300 million for other programs due to higher volume (primarily ADP); about $210 million for the F-16 program due to increased volume on modernization contracts; and about $110 million for the F-22 program due to increased sustainment volume. These increases were partially offset by a decrease of approximately $130 million for the C-130 program primarily due to lower volume on sustainment activities and about $130 million for the C-5 program due to lower volume as deliveries under the current production modernization program were completed in the third quarter of 2018. Aeronautics' operating profit in 2018 increased $96 million, or 4 percent, compared to 2017. Operating profit increased approximately $250 million for the F-35 program due to increased volume on higher margin production contracts and new development activities and better performance on sustainment. This increase was partially offset by a decrease of about $65 million for the C-130 program due to lower risk retirements and lower sustainment volume; about $60 million for the F-16 program due to lower risk retirements; and about $35 million for the C-5 program due to lower risk retirements and lower production volume. Adjustments not related to volume, primarily net profit booking rate adjustments, were about $175 million lower in 2018 compared to 2017. MFC's net sales in the fourth quarter of 2018 increased $435 million, or 22 percent, compared to the same period in 2017. The increase was primarily attributable to higher net sales of approximately $310 million for tactical and strike missile programs due to increased volume (primarily classified programs and precision fires); and about $80 million for integrated air and missile defense programs due to increased volume (primarily Terminal High Altitude Area Defense (THAAD) and Patriot Advanced Capability-3 (PAC-3)). MFC's operating profit in the fourth quarter of 2018 increased $127 million, or 51 percent, compared to the same period in 2017. Operating profit increased approximately $60 million for tactical and strike missile programs due to increased risk retirements and increased volume (primarily precision fires); about $30 million for sensors and global sustainment programs due to higher risk retirements (primarily LANTIRN®, SNIPER®, and Apache); and about $20 million for integrated air and missile defense programs due to higher risk retirements and higher volume (primarily PAC-3 and THAAD). Adjustments not related to volume, primarily net profit booking rate adjustments, were about $60 million higher in the fourth quarter of 2018 compared to the same period in 2017. MFC's net sales in 2018 increased $1.2 billion, or 16 percent, compared to 2017. The increase was primarily attributable to higher net sales of approximately $925 million for tactical and strike missile programs due to increased volume (primarily classified programs and precision fires); and about $185 million for sensors and global sustainment programs due to increased volume (primarily LANTIRN, SNIPER, and Apache). MFC's operating profit in 2018 increased $214 million, or 21 percent, compared to 2017. Operating profit increased approximately $140 million for tactical and strike missile programs due to reserves which were recorded in 2017 but did not recur in 2018 (primarily JAGM), higher risk retirements (primarily precision fires and Hellfire) and higher volume (primarily precision fires); and about $50 million for sensors and global sustainment programs due to higher risk retirements and higher volume (primarily LANTIRN, SNIPER, and Apache), after charges of approximately $85 million previously recorded in 2018 for performance matters on the Warrior Capability Sustainment Program. Adjustments not related to volume, including net profit booking rate adjustments and other items, were about $200 million higher in 2018 compared to 2017. RMS' net sales in the fourth quarter of 2018 decreased $146 million, or 4 percent, compared to the same period in 2017. The decrease was primarily attributable to lower net sales of approximately $75 million for Sikorsky helicopter programs, which reflect lower volume for Black Hawk production, partially offset by higher volume for mission systems programs; and about $60 million for C6ISR (command, control, communications, computers, cyber, combat systems, intelligence, surveillance, and reconnaissance) programs due to lower volume on multiple programs. RMS' operating profit in the fourth quarter of 2018 increased $43 million, or 17 percent, compared to the same period in 2017. Operating profit increased approximately $70 million for Sikorsky helicopter programs due to higher risk retirements, better cost performance across the Sikorsky portfolio and better cost performance on the Multi-Year IX contract. This increase was partially offset by a decrease of $20 million for integrated warfare systems and sensors (IWSS) programs primarily due to reserves recorded for performance matters on two programs. Adjustments not related to volume, including net profit booking rate adjustments and other items, were about $45 million higher in the fourth quarter of 2018 compared to the same period in 2017. RMS' net sales in 2018 increased $587 million, or 4 percent, compared to 2017. The increase was primarily attributable to higher net sales of approximately $525 million for IWSS programs due to higher volume (primarily radar surveillance systems programs and Multi Mission Surface Combatant); and about $250 million for C6ISR programs due to higher volume on multiple programs. 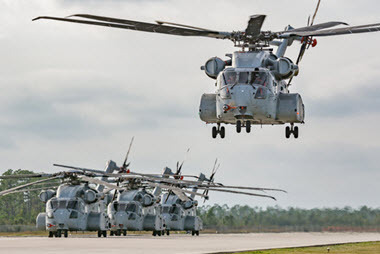 These increases were partially offset by a decrease of approximately $270 million for Sikorsky helicopter programs, which reflect lower volume for Black Hawk production, partially offset by higher volume for CH-53K King Stallion development and for mission systems programs. RMS' operating profit in 2018 increased $400 million, or 44 percent, compared to 2017. Operating profit increased approximately $185 million for C6ISR programs due to charges of $120 million for performance matters on the EADGE-T contract, recorded in 2017 but which did not recur in 2018, and due to higher risk retirements (primarily undersea systems programs); about $155 million for Sikorsky helicopter programs due to better cost performance across the Sikorsky portfolio and better cost performance on the Multi-Year IX contract; and about $105 million for IWSS programs due to higher risk retirements and higher volume (primarily Aegis). Adjustments not related to volume, including net profit booking rate adjustments and other items, were about $185 million higher in 2018 compared to 2017. Space's net sales in the fourth quarter of 2018 increased $49 million, or 2 percent, compared to the same period in 2017. The increase was primarily attributable to higher net sales of approximately $25 million for the Orion program due to higher volume; about $15 million for strategic and missile defense programs due to higher volume (primarily Fleet Ballistic Missiles); and about $15 million for government satellite programs due to higher volume (primarily government satellite services). Space's operating profit in the fourth quarter of 2018 increased $9 million, or 4 percent, compared to the same period in 2017. Operating profit increased approximately $30 million for commercial satellite programs, which reflect charges for performance matters in the fourth quarter of 2017 which did not recur in 2018. This increase was partially offset by a decrease of about $15 million for government satellite programs primarily due to lower risk retirements on multiple programs. Adjustments not related to volume, including net profit booking rate adjustments and other items, were comparable in the fourth quarter of 2018 and the fourth quarter of 2017. Space's net sales in 2018 increased $203 million, or 2 percent, compared to 2017. The increase was primarily attributable to higher net sales of approximately $225 million for strategic and missile defense programs due to higher volume (primarily AWE Management Limited (AWE) and Fleet Ballistic Missiles) and about $65 million for the Orion program due to higher volume. These increases were partially offset by a decrease of approximately $70 million for commercial satellite programs due to lower volume and about $25 million for government satellite programs due to lower volume. Space's operating profit in 2018 increased $75 million, or 8 percent, compared to 2017. Operating profit increased approximately $40 million for commercial satellite programs, which reflect a lower amount of charges recorded for performance matters on certain programs; and about $30 million for government satellite programs primarily due to higher volume and higher risk retirements for government satellite services. Adjustments not related to volume, including net profit booking rate adjustments and other items, were about $30 million higher in 2018 compared to 2017. Total equity earnings recognized by Space (primarily ULA) represented approximately $30 million, or 13 percent and approximately $210 million, or 20 percent, of this business segment's operating profit during the quarter and the year ended Dec. 31, 2018, compared to approximately $35 million, or 16 percent and approximately $205 million, or 21 percent, during the quarter and the year ended Dec. 31, 2017. The corporation's effective income tax rate from continuing operations was 15.5 percent and 13.6 percent in the quarter and year ended Dec. 31, 2018, compared to 152.0 percent and 64.0 percent in the quarter and year ended Dec. 31, 2017. The lower rate for the fourth quarter and year ended Dec. 31, 2018 was primarily due to the reduction of the federal statutory rate from 35 percent to 21 percent and the deduction for foreign derived intangible income, both as a result of the Tax Act enacted in Dec. 2017. In Dec. 2017 as a result of the Tax Act, we wrote down our net deferred tax assets and recorded a net one-time charge of $2.0 billion ($6.88 per share in the quarter and $6.77 per share in the year ended 2017), substantially all of which was non-cash. The write-down was primarily related to re-measurement of certain net deferred tax assets using the lower U.S. corporate income tax rate (approximately $1.9 billion), a deemed repatriation tax (approximately $43 million), and a reduction in the U.S. manufacturing benefit (approximately $81 million) as a result of corporation's decision to accelerate contributions to its pension fund in 2018. Excluding the net one-time charge, the corporation's effective income tax rate from continuing operations was 26.9 percent and 26.5 percent in the quarter and year ended Dec. 31, 2017. The rate for the year ended Dec. 31, 2018 also benefited from the corporation's change in a tax accounting method, recorded discretely in the third quarter, reflecting a 2012 Court of Federal Claims decision, which held that the tax basis in certain assets should be increased and realized upon the assets' disposition. The rates for both periods benefited from tax deductions for dividends paid to the corporation's defined contribution plans with an employee stock ownership plan feature, tax deductions for employee equity awards, and the research and development tax credit. In December 2018, certain of the corporation's pension plans used pension trust assets to purchase group annuity contracts from insurance companies for $2.6 billion. One such contract transferred $1.8 billion of our outstanding defined benefit pension obligations related to approximately 32,000 U.S. retirees and beneficiaries to an insurance company. As a result of this transaction, the insurance company is now required to pay and administer the retirement benefits owed to these retirees and beneficiaries. The second transaction requires another insurance company to reimburse our pension trust fund for all future benefit payments made to approximately 9,000 U.S. retirees and beneficiaries under a group annuity contract purchased for $0.8 billion. Under the terms of this transaction, the plan will continue to pay and administer the retirement benefits to these retirees and beneficiaries but will be reimbursed for all future benefit payments covered by the contract with no net ongoing cash funding obligation to the plan for the covered participants as the cost of providing benefits is funded by the contract. These transactions have no impact on the amount, timing, or form of the monthly retirement benefit payments to the covered retirees and beneficiaries. Additionally, these transactions did not impact the corporation's earnings or cash flows in 2018. This news release contains the following non-generally accepted accounting principles (GAAP) financial measures (as defined by U.S. Securities and Exchange Commission Regulation G). While the corporation believes that these non-GAAP financial measures may be useful in evaluating the financial performance of Lockheed Martin, this information should be considered supplemental and is not a substitute for financial information prepared in accordance with GAAP. In addition, the corporation's definitions for non-GAAP financial measures may differ from similarly titled measures used by other companies or analysts. Business segment operating profit represents the total earnings from the corporation's business segments before unallocated income and expense, interest expense, other non-operating income and expenses, and income tax expense. This measure is used by the corporation's senior management in evaluating the performance of its business segments and is a performance goal in the corporation's annual incentive plan. Business segment operating margin is calculated by dividing business segment operating profit by sales. The table below reconciles the non-GAAP measure business segment operating profit with the most directly comparable GAAP financial measure, consolidated operating profit. Refer to the supplemental table "Other Financial and Operating Information" included in this news release for a detail of the FAS/CAS operating adjustment, which excludes $575 million of expected non-service cost that will be recorded in other non-operating expense, net in accordance with ASU 2017-07. Adjusted earnings from continuing operations and adjusted earnings per share from continuing operations represents net earnings (loss) from continuing operations plus the net one-time charge, primarily related to the estimated impacts of the Tax Act. Management believes that the exclusion of the net one-time charge provides a more useful comparison of the corporation's underlying business performance from period to period. However, this information is supplemental and should not be considered a substitute for financial measures prepared in accordance with GAAP. Lockheed Martin Corporation will webcast live the earnings results conference call (listen-only mode) on Tuesday, Jan. 29, 2019, at 11:00 a.m. ET. The live webcast and relevant financial charts will be available for download on the Lockheed Martin Investor Relations website at www.lockheedmartin.com/investor. For additional information, visit our website: www.lockheedmartin.com. Headquartered in Bethesda, Maryland, Lockheed Martin Corporation is a global security and aerospace company that employs approximately 105,000 people worldwide and is principally engaged in the research, design, development, manufacture, integration and sustainment of advanced technology systems, products and services. the outcome of legal proceedings, bid protests, environmental remediation efforts, government investigations or government allegations that the corporation has failed to comply with law, other contingencies and U.S. Government identification of deficiencies in the corporation's business systems. These are only some of the factors that may affect the forward-looking statements contained in this news release. For a discussion identifying additional important factors that could cause actual results to vary materially from those anticipated in the forward-looking statements, see the corporation's filings with the U.S. Securities and Exchange Commission (SEC) including, but not limited to, "Management's Discussion and Analysis of Financial Condition and Results of Operations" and "Risk Factors" in the corporation's Annual Report on Form 10-K for the year ended Dec. 31, 2017 and subsequent quarterly reports on Form 10-Q. The corporation's filings may be accessed through the Investor Relations page of its website, www.lockheedmartin.com/investor, or through the website maintained by the SEC at www.sec.gov. The corporation's actual financial results likely will be different from those projected due to the inherent nature of projections. Given these uncertainties, forward-looking statements should not be relied on in making investment decisions. The forward-looking statements contained in this news release speak only as of the date of its filing. Except where required by applicable law, the corporation expressly disclaims a duty to provide updates to forward-looking statements after the date of this news release to reflect subsequent events, changed circumstances, changes in expectations, or the estimates and assumptions associated with them. The forward-looking statements in this news release are intended to be subject to the safe harbor protection provided by the federal securities laws. non-cash asset impairment charge recorded by AMMROC. of completing its remaining obligations. $6.77 per share in 2017), substantially all of which was non-cash, primarily related to the estimated impacts of the Tax Cuts and Jobs Act. net working capital and certain tax adjustments. share amount for the year ended Dec. 31, 2017.
share, after tax) associated with planned workforce reductions and the consolidation of certain operations at the corporation's RMS business. for the year ended Dec. 31, 2017), which represents its portion of a non-cash asset impairment charge recorded by AMMROC. measurement of its postretirement benefit plans. This reduction was offset by $1.2 billion recognition of previously deferred amounts. accumulated other comprehensive loss resulting from the Tax Cuts and Jobs Act to retained earnings. plans in the table above, for a total of $868 million in 2018.